Shortbread, almond and raspberry can there be a better flavor combination? 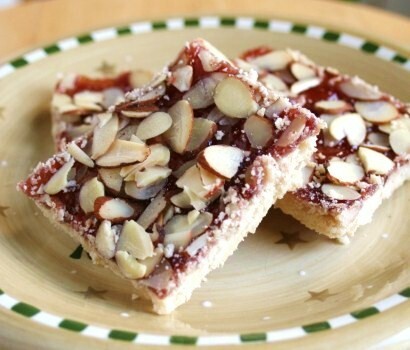 I love anything with raspberry and almonds. It really just goes so well together. I make these for the holidays every year and are always a big hit. Another easy recipe. In a large bowl, cream butter and sugar until light and fluffy. Beat in egg and almond extract. In another bowl, combine flour and baking powder, then gradually add to the creamed mixture and mix well. Press the dough into a greased 13-inch x 9-inch baking pan. Spread with preserves. Sprinkle with almonds. Bake for 30-35 minutes or until golden brown. Cool and cut into bars.